Searching on the internet for a tracker, I came through ebay on the following APRS tracker + GPS receiver inside. I ordered and within a week it was neatly delivered. 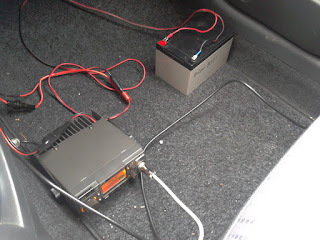 The idea was to use it in combination with the ICOM IC-228H. I bought a serial 1:1 cable and cut one plug. On this side I soldered a 8-pin microphone plug, what a hassle. From the beginning it worked almost equal. Reception is not yet fully functional, with a C of 4.7nF in the audio line it would also be good to go. Today I planned a trip. First to Hillegom. Then via Leiden to The Hague. From there, via Rotterdam to Tiel. On my way to Hillegom I used only 5 watts, more was not possible from the cigarette lighter. In Hillegom I received a battery that is ideally suited for this purpose. The full power of the set can be use without problems. I will not be qrv with APRS every time I drive my care. This will be incidental.